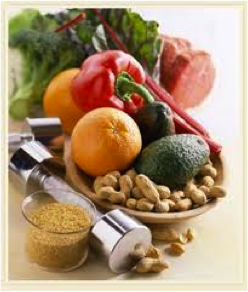 Energy in food comes from three nutrients called macronutrients: carbohydrates, protein, and fat. Each one plays a different but important role in helping your body function, perform, and recover optimally. In this post I’ll breakdown what each nutrient does, how much of it you need, and the best food sources. Next week I’ll talk about how to time the intake of these nutrients for the best performance and recovery. Carbohydrates provide fuel and are the body’s most readily available source of energy. When you eat carbohydrates, the body breaks them down into the simple sugar glucose, which is then transported throughout the body to provide energy, fuel important reactions, and maintain blood sugar levels. Any glucose not used immediately is stored in your liver as glycogen. During quick bouts of exercise, like a 100 meter sprint, the body uses glucose as the main source of fuel. But when it needs additional energy during longer workouts, it will draw on its glycogen stores, as well as stored fat, for energy. Having enough glycogen stored up for the body to use will allow you to perform at your best, both in competition and training. On the other hand, not getting enough carbohydrates and energy to meet your needs over an extended period of time can weaken your immune system – meaning you could get sick more often – and make you feel less energetic. Carbohydrates come from a variety of sources, and some are better than others. Some of the better sources of carbohydrates include fruits and vegetables, starches like sweet potato, and some whole grains. Fruits and vegetables are the best sources of carbohydrates because they have more fiber and other nutrients like vitamins and minerals and are less energy dense. If you choose grains, make sure they are 100% whole grains like brown rice, quinoa, whole wheat bread or pasta, etc. The carbohydrates to avoid include baked goods, simple sugars (like table sugar and syrups), processed grains (or “white” grains), and other processed snack foods. How much carbohydrate you need depends on the intensity and volume of training, gender, and type of sport. Research indicates that athletes need 6-12 grams of carbohydrate per kilogram of body weight (weight in kilograms = weight in pounds divided by 2.2). Women and less active athletes will be on the lower end of that range, while men or endurance athletes will be on the higher end. So for example, a 140-pound female rower doing intense preseason training would try to eat around 8 grams of carbohydrate per kilogram of body weight, or close to 500 grams of per day. However the same athlete would need about 380 grams of carbohydrate (6 grams per kilogram of weight) per day during the less intense off-season, and less than 6 grams per kilogram during times of inactivity like rest, vacation, or injury. Protein is involved in many important reactions occurring in the body and is a primary component of hair, nails, DNA, and muscle. Not eating enough protein to meet your needs over time can lead to problems such as low energy levels, slowed healing of wounds like bruises and cuts, greater than normal muscle soreness, and trouble sleeping, among other things. Athletes need protein to allow the body to recover and repair muscle fibers broken down during training. In addition, protein requires more energy to digest than carbohydrates or fat and has been shown to help moderate blood sugar levels and help maintain satiety. What his means is that protein not only rebuilds muscle and aids recovery but also helps you stave off hunger after meals and keeps you from having the dreaded “crash” you get a few hours after eating a high sugar food like a bagel or doughnut. The best sources of protein are lean animal products including chicken, lean beef, turkey, buffalo, fish and eggs. Protein is made up of chains of smaller units called amino acids, and of the 22 known amino acids 9 of them are not made by the body and must be obtained from the diet. Only animal products contain all 9 of these essential amino acids. You can also find protein in nuts and nut butters, seeds, soy, and dairy products however these items offer less protein and can have more sugar or fat per serving. Protein needs vary depending on sport, gender, and volume of training. Current recommendations suggest that athletes need 1.2-1.7 grams of protein per kilogram of body weight. As with carbohydrate needs, women and those doing less volume will be on the lower end of that range while men and higher volume strength and endurance athletes will be on the higher end. Fat is the body’s stored form of energy. During longer, moderate exercise like running, up to 50% of the body’s energy can come from fat metabolism. It is a key part of cell membranes, helps protect organs, and aids in the absorption of four key vitamins: A, D, K, and E. Fat slows down the rate that food is digested, and like protein helps moderate blood sugar and maintain fullness. But not all fats are created equal! The good fats, unsaturated fats, include oils, nuts and nut butters, and fatty fish. One type of unsaturated fat – omega 3 fat – has been shown by research to help brain function and cognition, reduce inflammation, and reduce the risk of heart disease and cancer. You can find them in cold water fish like salmon and mackerel, flax seeds, pumpkin seeds, nuts, and plant and nut oils. The bad fats, or saturated fats, are solid at room temperature and include butter, mayonnaise, and salad dressing. Saturated fats are also found in higher fat meats. It’s important to remember that some saturated fat is okay, especially if it comes from red meat since red meat provides other important nutrients like iron (to prevent anemia) and zinc (helps with healing and immune system function). But wait! There is one exception to this rule, and that is coconut oil. Coconut oil is a saturated fat, but it is structured differently than other fats, making it easier to absorb during digestion. It has no negative effect on cholesterol like other saturated fats and has been reported to protect against heart disease, promote a healthy weight, and boost immune system function. 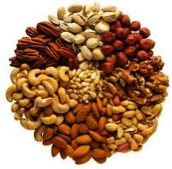 There are no set recommendations for fat intake for athletes, but the important thing is making sure you get enough healthy fat, especially omega 3’s, by including nuts, seeds, oils, avocado, and meat in your diet regularly. Avoid fat from sources like baked goods, fried food, and fast food. And now for the recipe and daily challenge! On Monday coach Pat discussed the importance of preparation. Preparation is key for staying on track with a healthy diet, as oftentimes the “convenience foods” are the least nutritious. It takes effort and planning to get all the nutrients you need but it’s well worth it! Plan to get a serving of omega 3 fats today! Eat some fish like salmon, tuna, or halibut, or some nuts. Add flax seeds to your oatmeal or yogurt. Comment and tell us what you did! Also comment with any questions. I found this recipe online and it’s my new go-to when cooking salmon. The ingredients are in most pantries and prep time is short. This meal makes 3-4 servings and provides the protein and carbohydrate you need to recover as well as a serving of omega 3 fats. Add some green vegetables or a salad for a completely balanced (and awesome) meal! Salmon – Combine all the seasoning ingredients and mix well. Spread over salmon and bake skin side down 20-30 minutes at 350 degrees. Sweet Potato – wrap 3 sweet potatoes in foil and bake at 400 degrees for 45 minutes, or until you can easily poke them with a fork. Let cool a few minutes. Unwrap and mash with potato masher. Add cinnamon to taste. 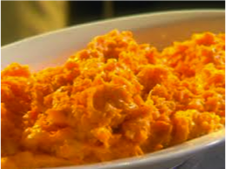 Tip: Make the sweet potatoes the night before and reheat to avoid a traffic jam in the oven. This entry was posted in Nutrition and tagged food, health, healthy-living, nutrition, whole grains fruits and vegetables by Renegade Rowing. Bookmark the permalink.